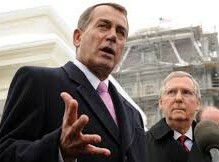 In a 60 Minutes interview with Scott Pelley, parts of which aired on Sunday, House speaker John Boehner and Senate majority leader Mitch McConnell made it sound like they are no closer to producing the elusive Obamacare alternative than they were five long years ago. Boehner proceeded to talk about what’s wrong with Obamacare. Obamacare first started being debated in the first half of 2009. Even before then, it was apparent that the chief problem with the private American health-care system was that the federal government had broken it by putting its foot on the scale through the tax code. That tax code gave lavish tax breaks to employer-based insurance while forcing millions of Americans in the individual market to buy insurance without any tax break. That’s still the case — although the chosen few now have lavish Obamacare subsidies sent to insurance companies on their behalf. Yet, in 2015, Republican congressional leaders still aren’t focused on fixing that unfairness in the tax code. And that’s even with King v. Burwell on the horizon, with the genuine opportunity it provides to advance a plan that would effectively repeal and replace Obamacare in 36 states and lay the groundwork for full repeal in 2017. Ed Gillespie ran on an alternative that would address this inequality in the tax code — and therefore fix what the federal government had broken even before Obamacare was passed and made things so much worse — and he exceeded expectations in his Senate race by a wide margin. “The question everyone seems to be asking is whether the men and women thinking about running for president are up to the job…. “The real question is whether the conservatives who will choose the next president – that’s you and me – will be up to our job…. “What does it mean to be principled? “Let me put it this way.